We went for an amble down to the pier, where I spent many a happy hour in my childhood eating icecreams and chucking stones into the water. It's different now, of course. *Someone* thought it would be a good idea to modernise. From the seafront the pier now looks like an old shed, up close - well, words failed me. 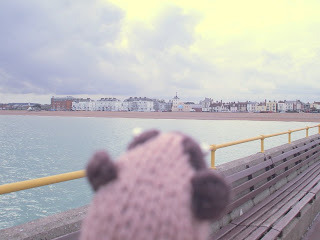 We walked back towards the seafront and in the distance I spotted the Time Ball. It's the building pretty much in the centre, just left of a blue roof (you'll need to click on the pic to enlarge it). When I was a child I assumed every town had a Time Ball, it's funny how much you take for granted! In fact, Deal Time Ball is very special. Wikipedia explains that time balls were an essential tool for ships. The ball was dropped daily at 1pm. allowing ships to accurately determine where they were. I just used it to see if I was late home for lunch! Can anyone explain to me why this island nation of ours has VOLUNTEER lifeboatmen? Only one more day till my competition finishes! Well, you learn something new everyday - never knew that about time balls. Did meerkat get an icecream? bit too chilly for ice creams! Its never too cold for ice-creams! My family has a long standing tradition of visiting my aunty in Aberdeen and when ever we do we HAVE to have an ice-cream on the beach front. 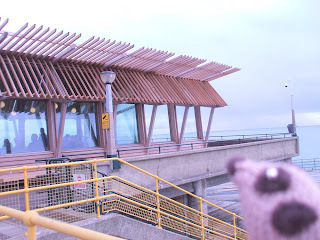 This year i visited in January - an had my ice-cream! lol Maybe i'm just mad!!! I love the Meerkat adventures and can't wait to see where you go next! I love that little knitted meerkat! Such a sweet little snout! He's so cute. Or she? 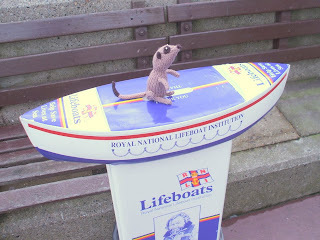 Anyway - that meerkat gets around.